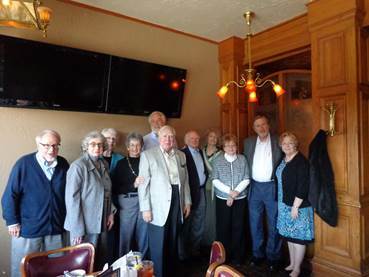 On March 27th, a number of the History Department’s emeritus faculty, spouses, and friends gathered for a reunion at the Copper Cellar. The event coincided with the annual Milton Klein lecture that afternoon, and provided a nice opportunity to reminisce about the department’s past, and to hear an update about its present. Attendees, left to right, are Dr. Paul Pinckney, Ms. Margaret Pinckney, Ms. Margaret Klein, Dr. Elaine Breslaw, Dr. John Muldowny, Dr. Ernie Freeberg (not retired), Dr. John “J.B.” Finger, Ms. Judi Gaston, Ms. Emma Jackson, Dr. Bruce Wheeler, Ms. Linda Wheeler.